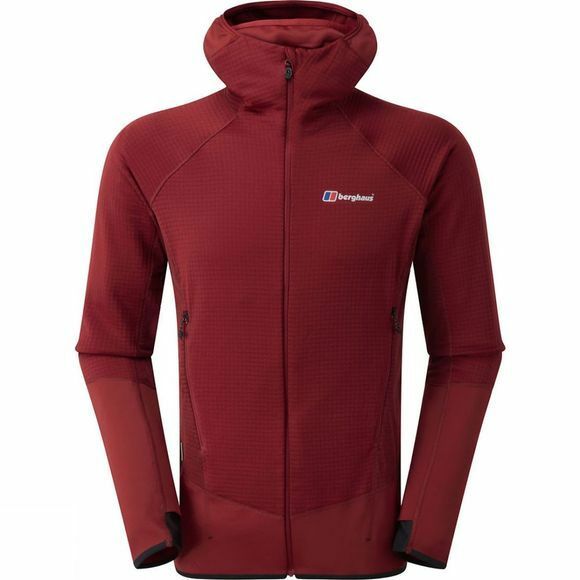 The Berghaus Men's Extrem 7000 Hoody is a technical lightweight fleece for year-round use with incredible wicking properties, exceptional warmth and a multi-use hood system to protect you in a range of conditions. Polartec Power Grid fabric has a jersey face and a shearling grid backer that wicks moisture away from your body exceptionally well. The body-mapped construction uses a heavier weight of fabric throughout the body where high thermally efficient and fast drying are essential, with a lighter version used in areas that require more breathability. Performance garment tailoring allows for dynamic body movement while climbing and belaying, and high-quality flatlock stitching is used throughout for low-profile seams, delivering enhanced comfort. The alpine balaclava is an adaptable hood and mask system that can be worn in multiple ways, providing neck, chin and head protection when needed. A face mask can be pulled over the head and provide protection to the face in fast-changing mountain weather. When not required, it can be comfortably stowed behind the head.